Pea leaf weevil is an invasive pest species that first hit Alberta in 1997 and has since continued to spread across Canada. 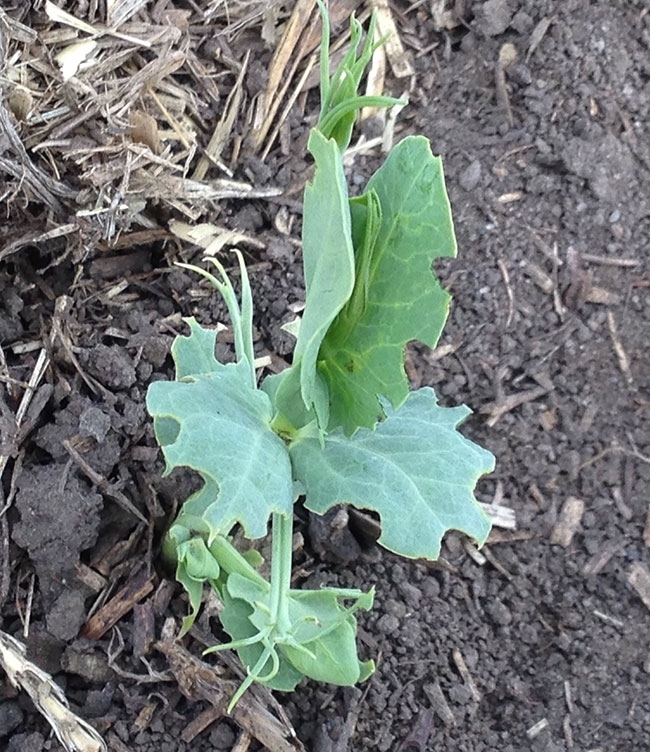 Foliar damage in field pea resulting from adult pea leaf weevil feeding. Pea leaf weevil is an invasive pest species that first hit Alberta in 1997 and has since continued to spread across Canada. “They’ve jumped Highway One, and last year or the summer before, they were found in Saskatoon, so it looks like they’re on the move,” says Maya Evenden, a professor in the department of biological sciences at the University of Alberta. The pest’s spread is bad news for pulse producers. Both pea leaf weevil larvae and the adult beetle can cause significant damage to its two reproductive host crops: field pea and fababean. Adult beetles feed on the leaves in the spring, causing characteristic “notching” damage. But the larvae cause more critical problems, Evenden says. Adults are “very fecund,” with the ability to lay thousands of eggs in the soil; the larvae that emerge feed on the root nodules that contain nitrogen-fixing bacteria. “It’s the destruction of the nodules and consumption of the nitrogen-fixing bacteria that causes the peas the most problems,” Evenden says. Evenden recently completed a study comparing the effectiveness of pheromone-based traps as monitoring tools over five years, between 2011 and 2015, with the hope of developing a reliable and easy-to-use monitoring tool for pea leaf weevil. Pheromone traps contain synthetic lures that exploit insects’ instinct to aggregate. The study compared weevil capture in pheromone traps with and without the addition of fababean volatiles. Evenden’s team checked the traps at regular intervals in the spring and in the fall. What they found was that pea leaf weevil, against Evenden’s predictions, responded to the pheromone traps in both seasons, despite the fact that they do not mate in the fall. 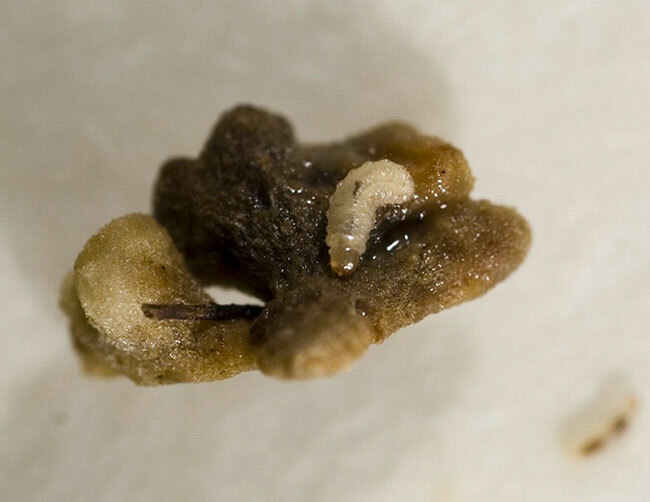 “From a pest management point of view, it is useful to have an estimate of what’s happening in the fall, which is important for growers who might want to plant insecticide treated seed the following spring,” Evenden says. The team also found that the bean volatiles increased the insects’ receptiveness to the pheromone; they trapped more insects in the combined pheromone-volatile traps, particularly in the fall. “What we believe is happening is the pea crop is senescing, so the smell of the bean in our trap is more apparent to the insects because the natural host volatiles have been removed,” she explains. Evenden has applied for another grant with the Agriculture Consortium to compare activity of the pest in pea and fababean, as well as to assess the suitability of fababean as a host crop. Researchers will also use the traps to measure the spread of the pest. In collaboration with researchers at the Saskatoon Research and Development Centre, Evenden is using trapping to control insect populations. She adds that producers could also use these traps to do their own monitoring, though the company from which they purchase pheromone and bean volatiles has not yet put them on the market. “Quite a few researchers are requesting these lures in Western Canada and Montana. I’m hoping they’ll make them commercially available,” she says. Foliar damage in field pea resulting from adult pea leaf weevil feeding. Héctor Cárcamo, a research scientist with Agriculture and Agri-Food Canada (AAFC) in Lethbridge, Alta., who works on integrated pest management techniques for pea leaf weevil, collaborated with Evenden on the pheromone trapping study. He says options are limited in terms of chemical controls, and the pulse industry is looking for alternatives to neonicotinoid insecticides after the Pest Management Regulatory Agency’s 2017 decision to phase out imidacloprid. Cárcamo has also just completed the second year of a three-year field test experiment in Lacombe, Alta., looking at the effectiveness of seed treatment and foliar insecticides (used alone and in combination) in controlling the pest in fababean. “Farmers have the option to use seed treatments or foliar insecticides. If they use the latter, when should they apply it?” he asks. His experiment looks at foliar applications timed for the second and fourth node stages, as well as a combination of seed treatments and foliar application at the second node stage. The second year of data showed that the use of a seed treatment (thiametoxam, a neonicotinoid insecticide registered for field pea) was most effective against the pest. Use of a foliar insecticide (Matador, a lambda-cyhalothrin Group 3 insecticide) showed very little benefit, says Cárcamo. 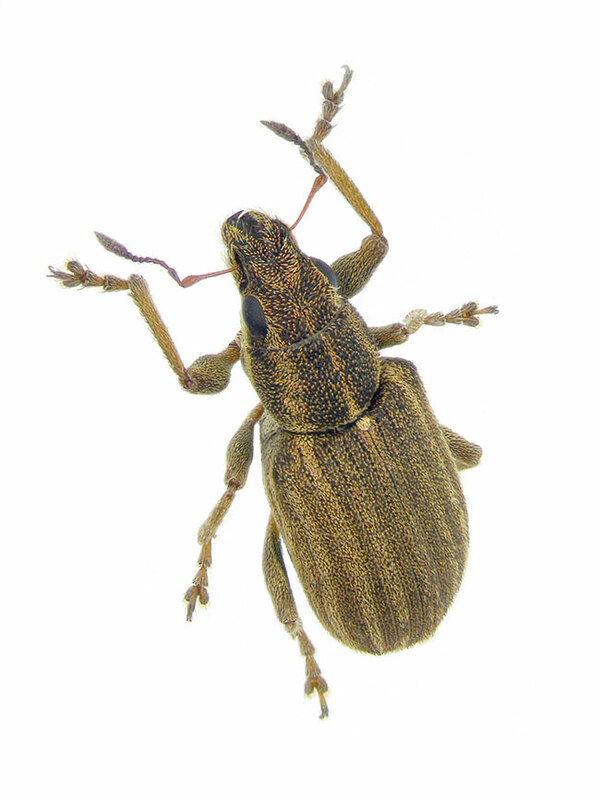 Cárcamo’s team concluded that insecticide seed coating is promising as a management tool for pea leaf weevil in fababean, but damage still occurs and may affect yield. Cárcamo’s recommendations to producers hoping to control pea leaf weevil start with monitoring. Alberta and Saskatchewan’s provincial entomologists both publish maps based on spring damage. Producers should check the maps to find out whether they are located in high-risk regions. Use of trap crops is also an option. Cárcamo says he’s tested the effectiveness of planting the same cultivar about 10 days earlier around the perimeter of a field and spraying to control pea leaf weevil. This method can be effective but requires careful timing and doesn’t tend to be attractive to most producers, due to the extra labour in the spring. Rotations are also key in managing the insect. If producers plant peas every other year they are increasing the overall amount of food available in a region for the insect. Cárcamo is working with Evenden on experiments forecasting populations in the fall. They are also looking at winter survivorship, to assess whether harsh winters impact populations in the spring. The studies are a promising start: Only once pea leaf weevil is better understood, can it be effectively controlled.